This was a project from yesterday, but I wanted y'all to see it. As I have been cleaning out, I have found baskets and baskets and more baskets! Didn't want to pack them away any longer and this is what I came up with. It turned out so much better than I thought that it would. I hung it in my kitchen over my hutch. I cut the board 9 feet, yep 9 feet long to fit the wall! I wrapped the ends in wire and hung it from swivel hooks. It's kinda hard to see, but the effect is fabulous. More tweaking pics coming tomorrow....gotta watch Private Practice. LOL!! It was beautiful today in K-ville and I got SOOO much done. It is so rewarding to me when I can get most of my LIST accomplished for that day. Not much left for today at all. I wanted to share my new spoon/bowl rack with y'all! 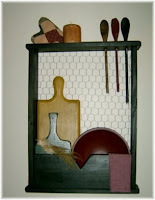 I made mine a little larger (than the one on my web site) to accomodate some of my cutting boards. Love, love, love the way it turned out in the black antiqued finish. 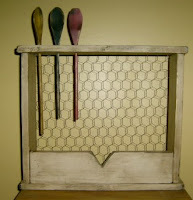 After putting up my new spoon rack, I started "Tweaking" a few things in my house. Boy, is that like a chain reaction or what? 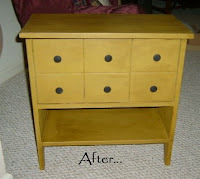 Went as far as filling in nail holes and touched up some paint. I'll be posting pics of some of my latest projects soon. MoRE GooDiES GoING tO MArkET! 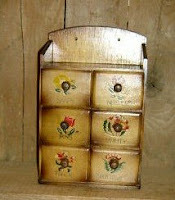 Here are a few more goodies going to the Antique Marketplace Booth tomorrow! 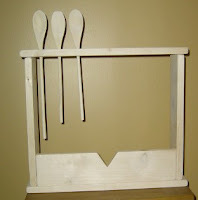 The spoon/bowl rack is sooooooooooo nice in person, as is the stove cover. First time that I've painted a table bench this color in this size. It really turned out nice. Working on some new fabric goodies...I'll try to show those tomorrow! Only $7.99 for the set of Two. NEw AT tHE MArKEtPLaCE TOdAY! I took a few things to the Marketplace today and wanted to share! I picked up some BriWax while I was there! I want to use it on some of my bigger wood pieces. Hopefully, I can show those later today!! LooKiE wHaT I MAdE ToDaY!! Just a quick post to show y'all what I made today....I'll paint them tomorrow and post pics of the finished pieces then!! So excited to make some bigger pieces! Be back soon. Time seems to fly by for me these days. 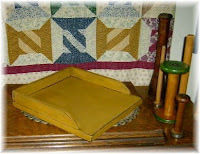 I thought once I got my taxes done, I would have more time to sew and craft. But, nowadays, I have so much on my plate that I have to just stop sometimes and make myself do something fun. Yesterday was one of those days! We got up somewhat early to go out for breakfast, then over to Wilson Tire Shop/Down Home Country to get the tires balanced on Bill's car, then off to Walnut Cove to take a special order and a few goodies for my booth there. We were done with all that by 10:00! Then back home for yard work and after lunch, a family Birthday Party for Alex. ( He was 5 on April 15th). Whew! What a full day we had! Am is supposed to send me some pics. The kids are so cute and I can't wait to post them for y'all to see. I did want to tell y'all that I may not send out an email to everyone that makes a comment or sends me an entry in my contest, but rest assured you are entered each and everytime! The response so far this month has been more than I could hope for! So exciting to see the entries increase month by month! Thanks so much for participating! New on my web site! Fabulous Spice Scent! Dusting Cap is offered in 2 choices now. The Tea Dyed Dusting Cap is so Prim and my personal favorite!! 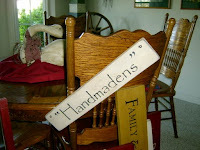 Homespun and Calico coming soon! Several folks have requested these back on my web site. So, here they are...you can choose from these sayings or I'll do your custom request and color. This is also back on my site for awhile. I was surprised at the folks that wanted it after I had decided to discontinue it. This one could also be done in your choice of sayings...........not just the one shown. Can y'all believe that it's already Wednesday ? Another week almost over.....but, I'm calling this good news Wednesday!! First , Cait has found a part-time job! Yipee! It's not her dream job, but it IS something. And second, Bill's test results came in the mail today and everything is normal. His doctor was even pleased with the good news! What a relief! My prayers were answered....he is on some high powered antibiotics, but I think he's definately on the right track. In other news today....We all went to the Marketplace today, but we didn't re-do the booth. It's not a 15 minute project and I think we're all short on time this week. There's so much to do and we need to look around for some display pieces. 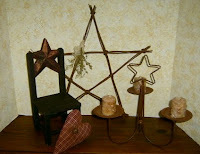 I'm personally not crazy about the "craft show" look and would love to make it more "homey looking". There's a few ideas floating around in my head.....we'll see. 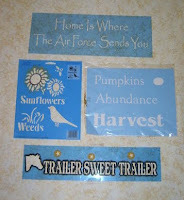 We also marked down some items .....mostly Easter and Spring, but a few other things as well. If you're near by, check it out. We'd love for you to come by and see us. We had a drawing today for a free Spring pillow and we plan on other giveaways in the weeks to come. This was new on my web site today. This little dough board is so cute. I have a couple scattered around my house and I love them. 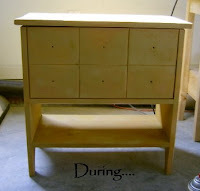 I Love this set of table benches. These will be offered on my site soon. I hope that everyone had a nice Easter holiday!! I had a really busy day and I am pooped! Think I'll have a glass of wine and go to bed. Tomorrow I will try to post some of the new things I'm working on. And later in the week, some new things that we're going to do at the Marketplace. We are going to redo the booth this week and change things around a bit. 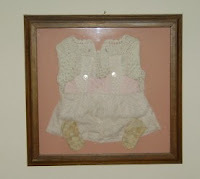 One of all-time favorite things..... My Mom saved this little outfit from when I was an infant and many years ago, my brother in law framed it for me in this fabulous shadow box frame. I have always moved this from house to house and never packed it away. I have always loved it and it has a lot of sentimental value to me and it always will. 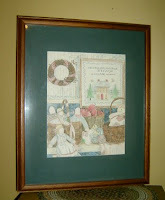 Another favorite of mine is a picture that was hand drawn by a dear friend of mine when I lived in Hoffman Estates, IL. in the 1980's. Her name was Ina Rohan and she lived in a neighboring city, Downers Grove, maybe. I told her what I wanted in my picture and she drew it....She is the most talented woman that I have personally ever met. Unfortunately, we didn't keep in touch when I moved to Greensboro back in 1991. I heard that she moved to Alexandria, VA with her husband Michael (He was a colonel in the service) and three daughters....one was Stacy, one was Katy and I don't remember the other one. If by chance anyone has ever heard of these folks...point her in my direction! Still lots to do for the Holiday weekend, so I'll go for now. Be back soon! 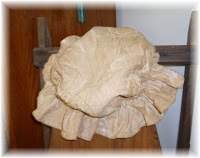 Just wanted to show what's new today on my web site! Can y'all believe that Wednesday is almost over already??? We have had such a busy week so far. Bill was home all day Monday with me. And yesterday he was scheduled for a couple of tests. We ended up spending hours and hours at the Drs. office . I told him tonight that I think it was a lot harder for me yesterday, cause I was the one waitin around. He was in la la land, so he didn't really care one way or the other. He was fine today and went back to as normal.....(We still don't know what is wrong with him, but he is at least NOT having the pain in his side). One good thing I did yesterday was read my last three issues of Country Sampler! I never seen to have the time to do much more than look at the pictures, but I actually read the articles that I was interested in. 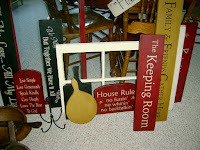 I loved the ones about my friend Karen of KM Primitives and Linda from my Behind My Red Door. 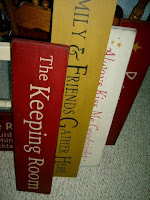 They both had so many ideas that my brain has been in a tizzy all day trying to come up with some new ideas for my home. 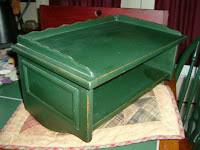 One of the things that I have been working on is this little table that I found a couple of years ago for $7.50. It has sat in my garage unpainted and unloved for way too long! Finally, I got it antiqued today! 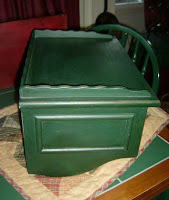 One day last week I put the first coat of paint on and wasn't REAL thrilled with it. Then I got busy and forgot about it. One evening I went out to the garage to cut wood and worked on it a little more. It started growing on me...LOL! And today I love it!! It really turned out better than I thought it was going to. 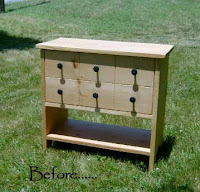 I was originally going to paint it black, but the little knobs are black and I didn't want to replace them. Sooo, I decided on this mustardy/goldy color. Happy Monday! I don't know about the rest of y'all, but we had a drastic change in the weather today. It has been so VERY nice here for the past several days, just like SPRING! We woke to pouring rain and howling winds this morning! Seriously thought for a minute that I might be in Kansas! After the 70 plus degrees on Sat. and Sun., the temps are dipping into the 40's or below tonite. One local weather guy even mentioned snow flurries! This is the April giveaway over at my web site! A fabulous package with a black basket filled with mini pillows, homespun cat pillow, Cinnabun room spray, grungy tapers, mini stenciled sign and a jar with a homespun cover, filled with rosehips. 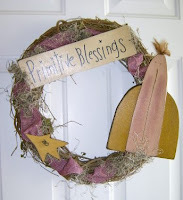 I think almost anyone would love this to add to their prim collection!! Also over at my web site, you can save 20% on your order thru the 13th of April. 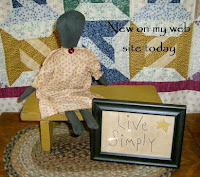 Check it out as I will be adding new goodies all this week. 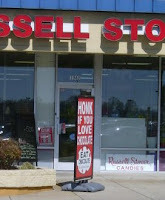 Anyway, after eating breakfast we went to Statesville to get candy. Yes....candy! 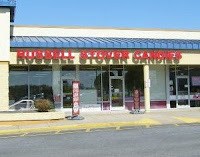 Not just any ole candy, but Russell Stover Candy! (I don't even know how far it is from our home, but it is a pretty good drive.) 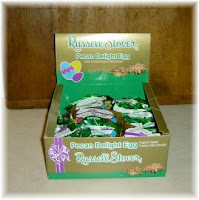 One of our favorites is the Pecan Clusters and we bought a box of 36, shaped like eggs !!! YUMMY!! They are such a treat for me! Outlet Store in Statesville....the sky really was that BLUE on Sat. 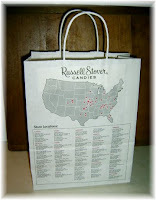 Bag that lists all the stores. Do you see one near you??? We bought enough to get TWO bags this trip. A couple of gifts (won't spoil the surprise just yet)! and TA DA!!! Our all time favorite!!!!! Beautiful weather on this Sunday afternoon in K-ville. The temps are in the high 70's with lots and lots of sunshine! The wind is barely blowing now, but we have had our fair share of gusts in the past few days. 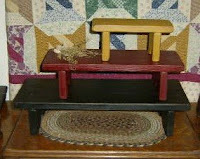 the detail is wonderful....it would be soooo cute with a doll, bear and pillows, don't ya think??? Maybe I'll try that later this week. 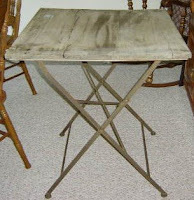 A grungy work table that looks as if it were left outside at Grandma's house. I think it will make a great display piece in our booth....maybe with crates stacked on top???? 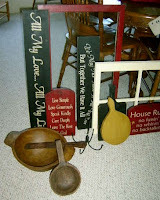 New things taken to the Market Place Booth today! We are over-filling it with Prim Goodies for all our Prim shoppers. If you're in the area, stop by and visit us! I'll be back tomorrow with some fabulous treasures that I found today!